Yesterday Word Press notified me that I’ve been blogging for a year! Happy anniversary. You fooled me. I figured you had been doing this for longer than that! Keep up the good work of sharing your handmade, homegrown beautiful life!! Happy 1st year! I found your blog thru a piano teacher blogger (Sara’s music studio) and I love your natural approach with profundity. I live in the Brussels, Belgium area and meant to take a photo of a beautiful flax field for you – next year, ok? Thank you so much! Sara has a lovely blog with so many good ideas. I would love to see a picture of that beautiful flax field. Oh, congratulations! And what a lovely picture on this post. I, too, get so much out of the blogging community. I truly feel as though I among friends. Happy anniversary! I’m glad you decided to Blog!! Thank you Sharon! I get so much inspiration from your blog too. You are so right about all the lovely people!!!! Yours is a beautiful blog. I look forward to it every time. Thank you for sharing your beautiful self. Oh, Julie!! Thank you. You have the nicest way of saying things. Your posts are always uplifting and your pictures are too… This mornings’ were positively ethereal! In that case, I would highly recommend you get the book: Sepp Holtzer’s Permaculture, I just finished it a few weeks ago and will hopefully soon write a quick review of it also, it is a must read for sure! Very inspiring and a lot of good easy to follow info. including food storage, ointments / natural remedies, creating ponds etc. Congratulations! I’m glad I have discovered your blog and will continue to follow with interest. Thank you!! I’m very glad to have found yours too. Wow! I thought you’d been at this a while, congratulations!!! Here is to may more!! Thank you!! My Winter buddy:). So many were picking their pansies already and we were still shoveling snow, lol. Congrats on your first year. I do enjoy your blog, so please keep on blogging! Thank – you! That is so nice! Thanks! 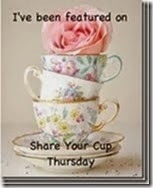 I found your blog in a blog hop.. I clicked on it because you had the name Cynthia, lol. Really glad I did! Congratulations! And here’s to many more! We celebrate you, Cynthia! I’ve learnt much from you and enjoyed your posts and photographs every time you appear on Reader. Thank you. Congratulations – and thanks for sharing your permaculture story! Congrats ! Love your stuff! Thanks, Michele! I love yours too!